Friend, this is what you need to do. 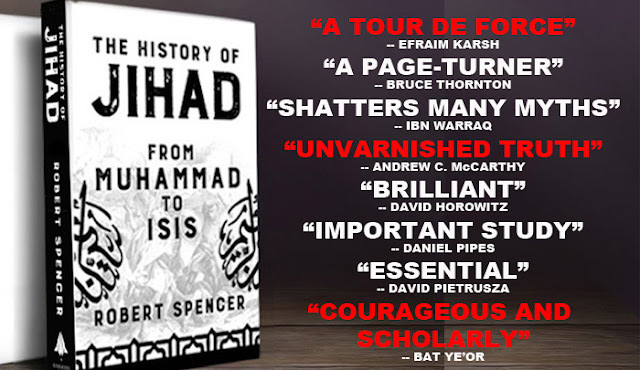 Go to your favorite brick-and-mortar store, or your favorite online site, and purchase a copy of Robert Spencer’s, “The History of Jihad: From Muhammad to ISIS.” Producing this book was a tremendous act of courage by Spencer and Bombardier Books. The same opponents of Western Civilization who rioted over the Danish Muhammad cartoons, who slaughtered the team at French humor magazine Charlie Hebdo, who murdered 37 innocent Turks at the Sivas Massacre, and who stabbed and shot the Japanese and Italian translators, and the Norwegian publisher, of Salman Rushdie’s “Satanic Verses” – those same dark forces want to riot and stab and bomb and slaughter over the words on these pages. Spencer and Bombardier deserve at the very least your investment in its full purchase price. Even if we are lucky enough to avoid nuclear war, jihad remains as a cultural, not merely a military, struggle. Jihad’s victories are won not just on the battlefield, but in American textbooks. Indeed, as the South Park controversy demonstrated, jihad is victorious in deciding when Americans are allowed to laugh. Jihad is aimed even at your right to say the word “jihad,” and, accurately, to define it. “While serving as Assistant to the President for Homeland Security and Counterterrorism, John Brennan declared, ‘…jihad is a holy struggle, a legitimate tenet of Islam, meaning to purify oneself or one’s community, and there is nothing holy or legitimate or Islamic about murdering men, women and children.” Brennan’s definition is BS. You deserve, you need, to know the truth. Jihad is a weapon aimed at you – at your freedoms, your sense of beauty, your relationships, your understanding of your own history and your intellectual honesty. “You” includes everybody. Yes, Muslims, I am talking to you. Jihad has been used, and is being used, as a tool for some Muslims to decide that other Muslims are not Muslim enough. Iran characterized the 1980-88 Iran-Iraq war as a jihad. That war killed and injured hundreds of thousands of Muslims. More recently, ISIS justified its genocide of Shia Muslims as jihad.